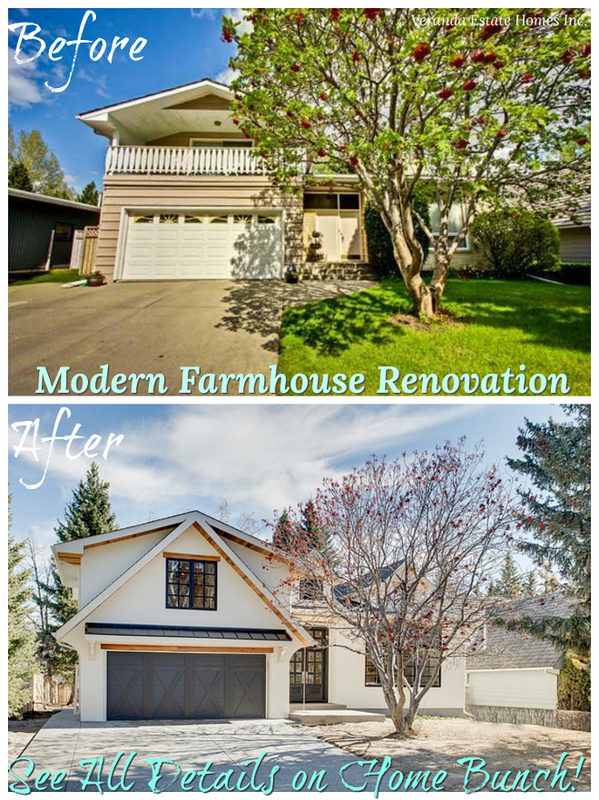 Most of us have been down this road before… as a first-time home buyer, it seems easy to buy a fixer upper and transform it into your dream home. It seems so easy on all of the HGTV shows we watch, right? Well, the real-life reality is not always like that. Working in this business for so many years now, I can’t tell you how many emails I’ve received from people desperate for help with their “DIY gone wrong” issues. 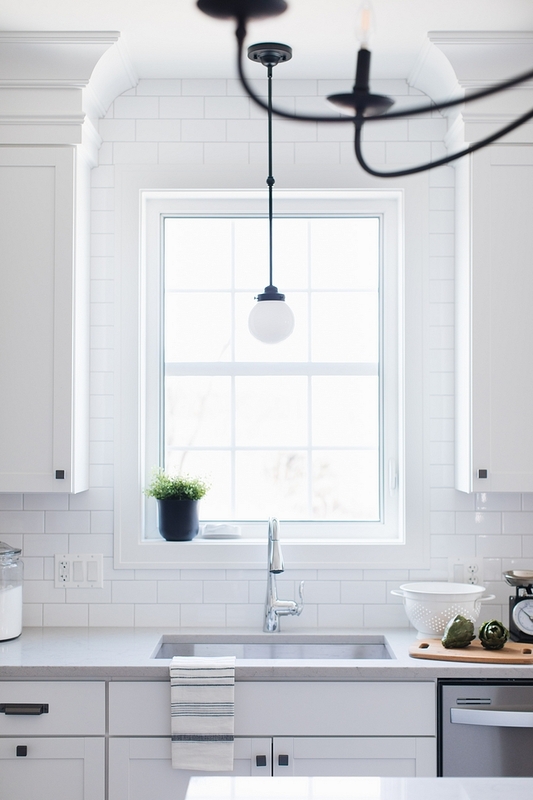 I think that, being a first-time home buyer, you should have some serious home improvement skills before attempting to renovate a fixer upper. This surely can save you some money as long you don’t make any expensive mistakes along the way. But if you don’t have the skills nor the time and energy, buying a newly-built home or having it built for you seems to be the best option. 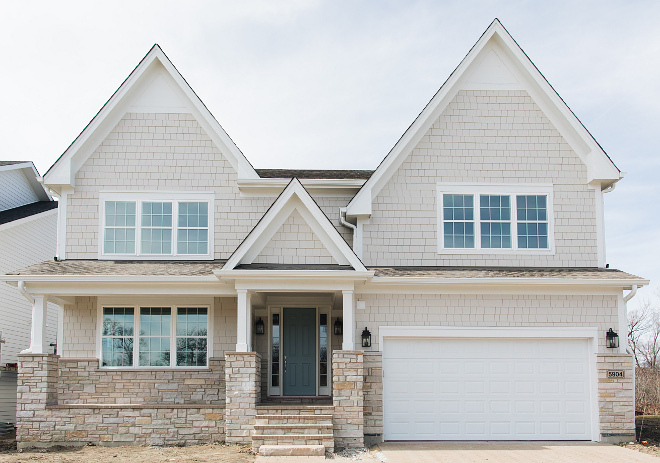 This new-construction is a spec house built by Timber Trails Development Company, in Western Springs, Il (a suburb of Chicago) and with interiors by Julie Howard – you see other beautiful houses by them here & here. This house is at their entry level price range and was designed for first-time home buyers or a family who love attention to detail without breaking the bank. 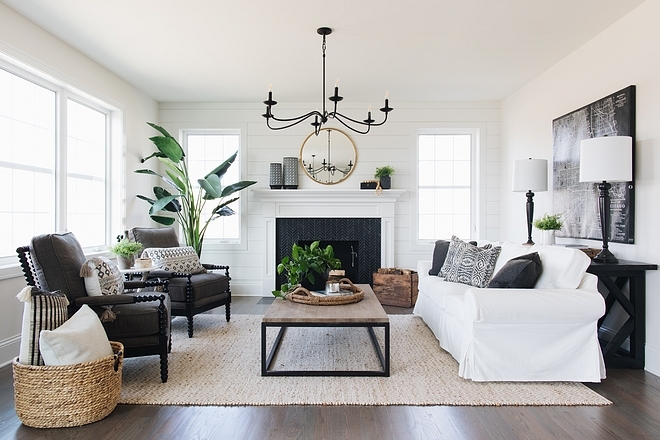 The farmhouse style is evident with the shiplap, white subway tile and iron light fixtures. 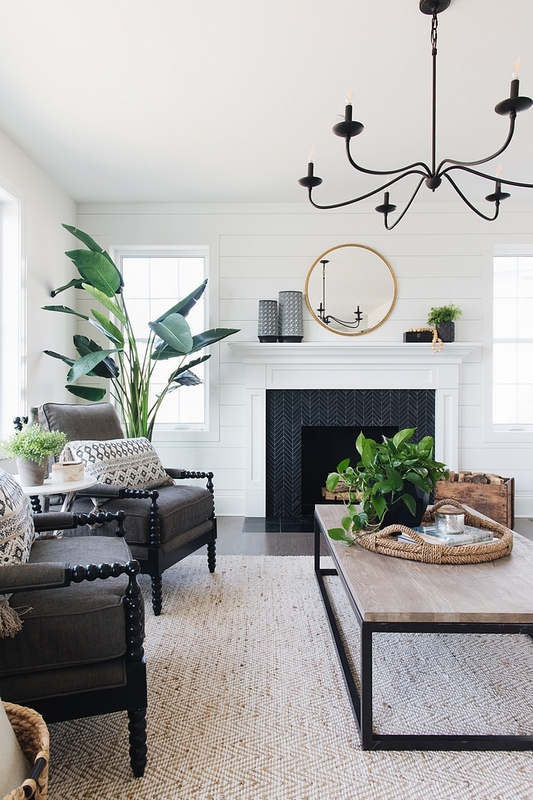 When designing this house they tried to channel their inner Joanna Gaines because let’s face it, who doesn’t love what she does! Enjoy! Front Door: Benjamin Moore Cloudy Sky. 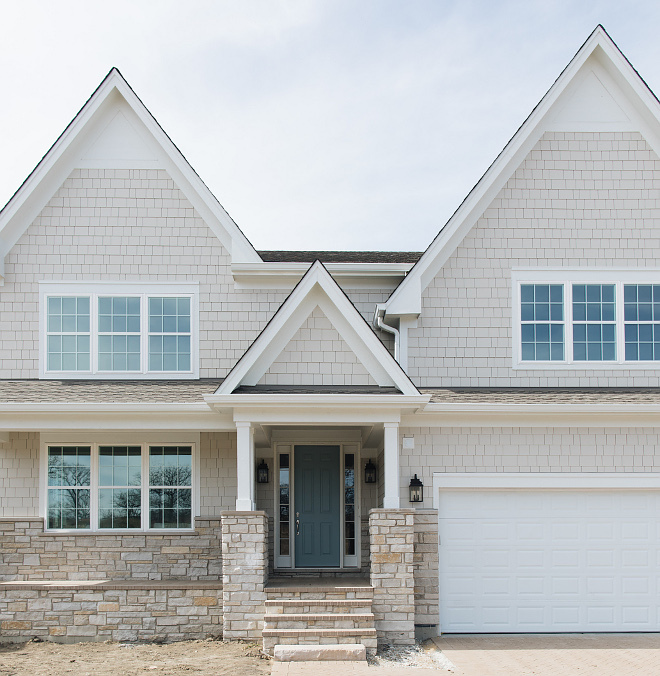 Exterior Colors: Trim – Hardie Arctic White. Shingles and Siding – Hardie Cobble Stone. Stone – Fond du Lac Rustic. Exterior Sconces: Here, Here, Here & Here. 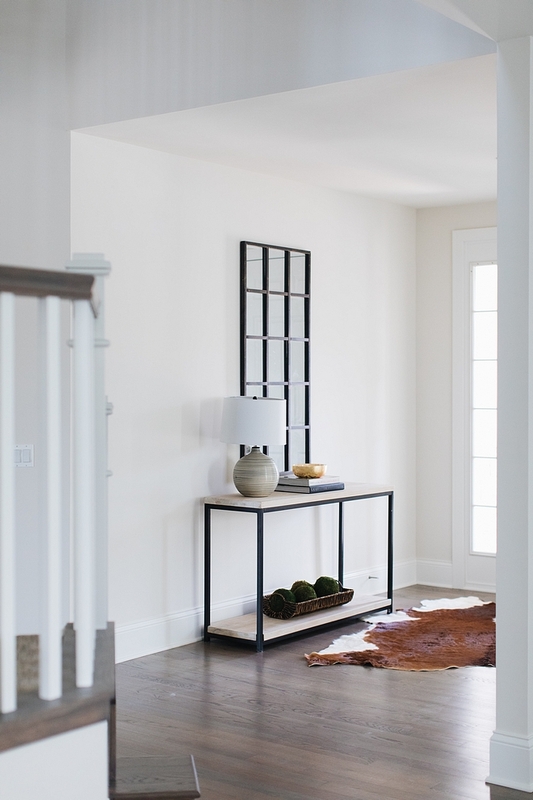 The front door opens to a bright foyer with light grey walls and beautiful hardwood flooring. 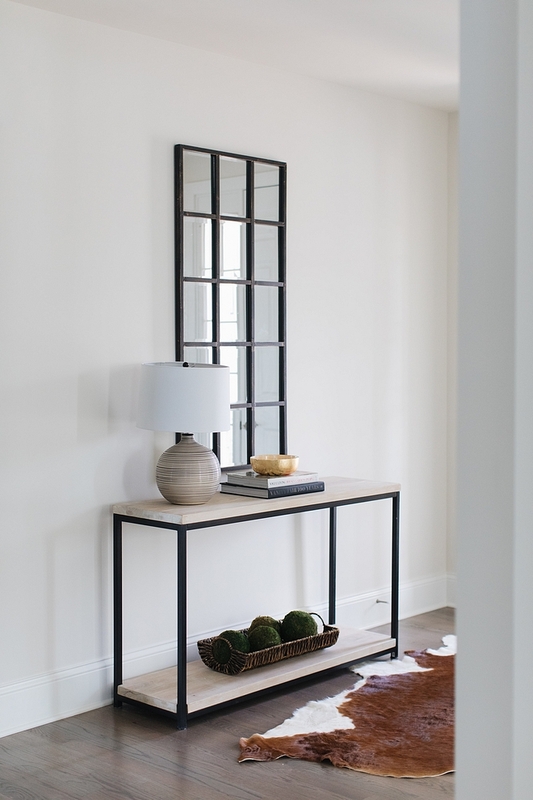 Similar Console Table: Here, Here & Here. Beautiful & Affordable Table Lamps: Here, Here, Here, Here, Here, Here, Here & Here. Similar Mirror: Here & Here (large). Wood Floors – Red Oak stained Minwax Classic Grey – similar here. Paint Color is Benjamin Moore Classic Grey. 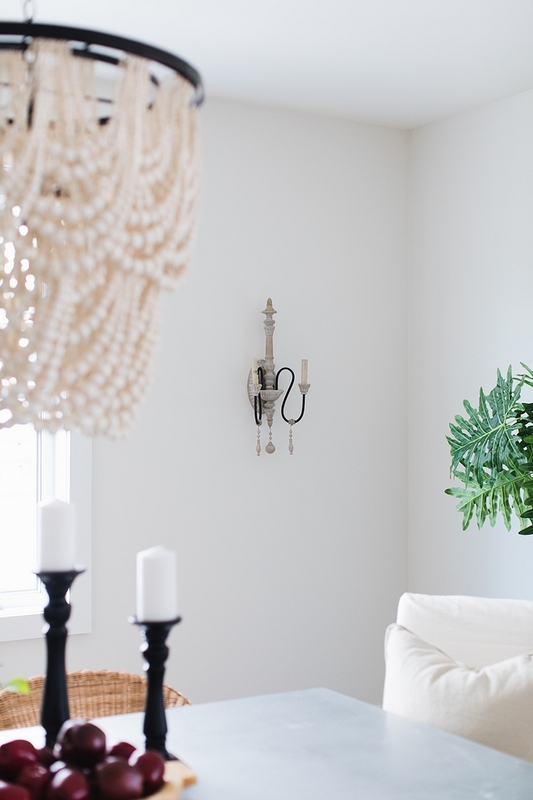 I love how uncluttered this home feels, which makes me think it’s not a hard place to clean!!! 🙂 Who has the time to undust piles and piles of decorative items, right? This is beautiful and easy! Natural Stools & Side Tables: Here, Here, Here, Here, Here & Here. Accent Table: Target. Other Metal Base Accent Tables: Here, Here, Here, Here, Here & Here. Rug – Ralph Lauren from HomeGoods – it was a score and I love the color it brings to the space. 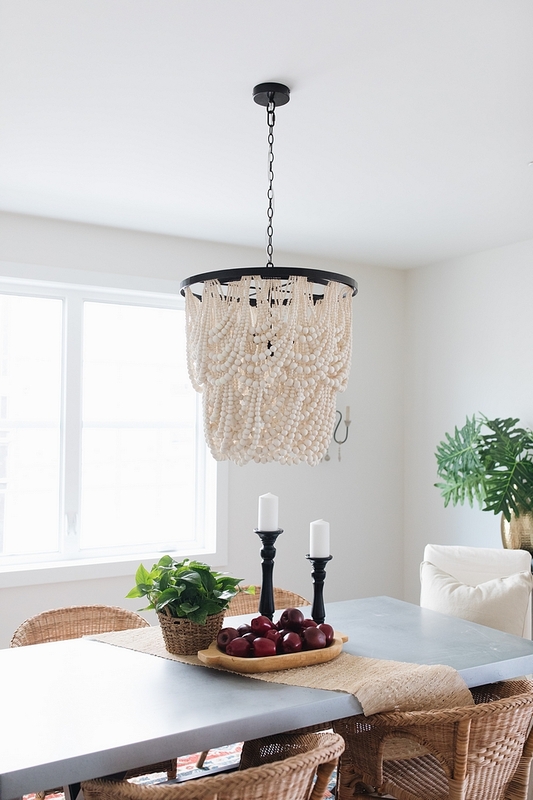 Chandelier – Pottery Barn Beaded Chandelier. 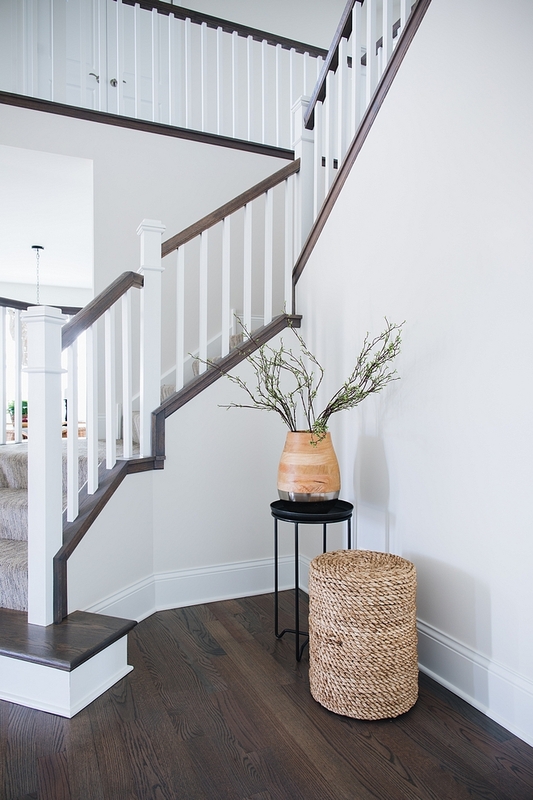 Classic Gray OC-23 Benjamin Moore. The sconces are from Joss and Main. Dining table is from Joss and Main. Dining Chairs – Ikea – Similar: Host Chairs: Here & Here (Ivory). 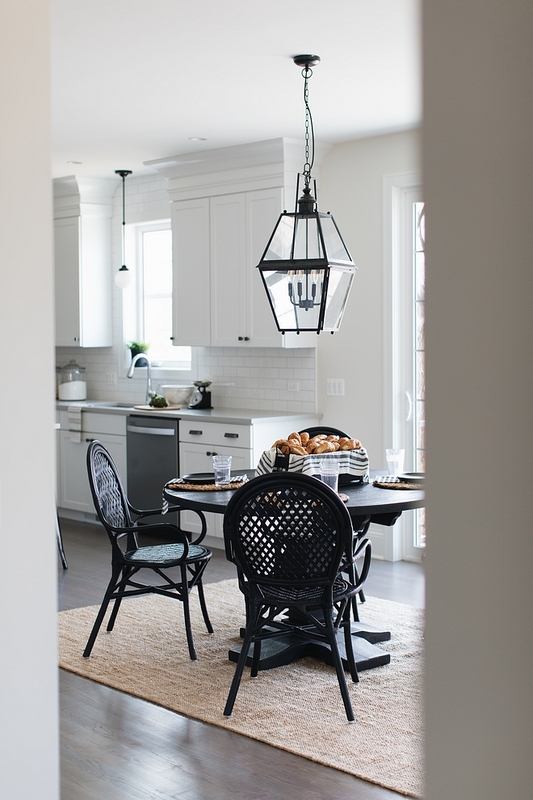 Breakfast Room Lantern: Here (currently on sale for $179! 🙂 ). 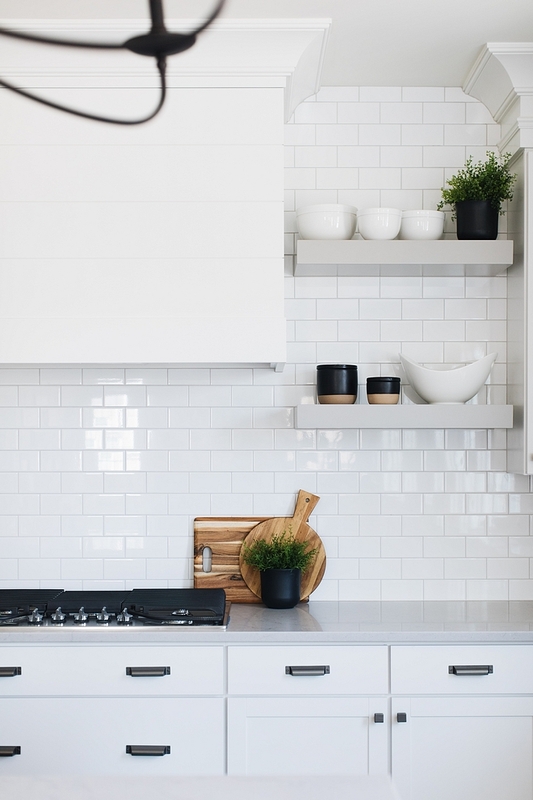 “The kitchen wow factor certainly comes from the classic backsplash. The kitchen came alive once the backsplash was installed. The shine the glossy tile gives when light hits it grabs your attention and gives the kitchen a higher quality feel. We used stock cabinets and built a soffit above out of trim moldings to make the cabinets feel custom. We did have our custom cabinet maker create our island, hood, and floating shelves. The idea of mixing high and low cabinets was something we really wanted to try to give buyers that option. We think it turned out great!” – Julie Howard (interior designer). 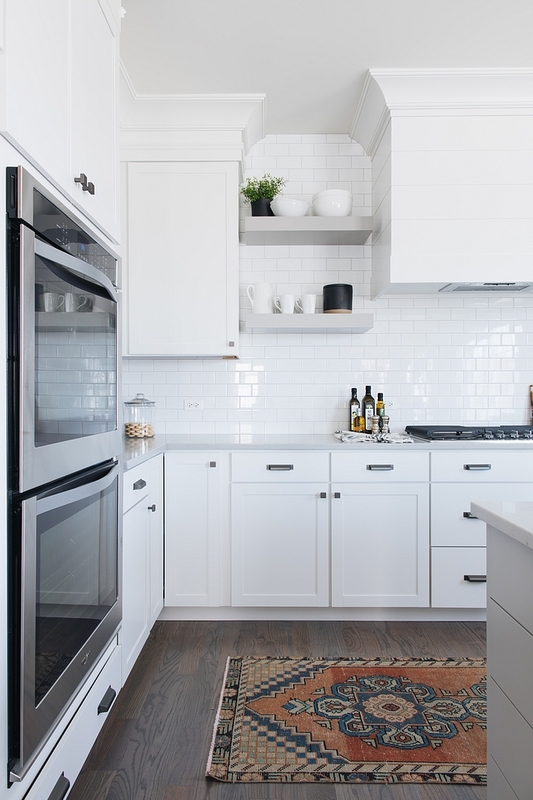 Backsplash Tile – Imperial in Gloss White by The Tile Shop with Whisper Grey Grout – similar here & here. Floating Shelves are 24” and custom made – Similar Floating Shelves: Here (white) & Here (Driftwood). Custom Cabinets – Made by Palos Fine Carpentry. The custom Hood and soffit were color matched to the white stock cabinets. Hood: Hood is 48” of Shiplap custom-made. Countertops – Caesarstone Georgian Bluffs. Cabinet Hardware: Channing Cup Pull in Ash Gray and 1 1/16” Channing Knob in Ash Grey. Kitchen Cabinets – Aristokraft Brellin in White. 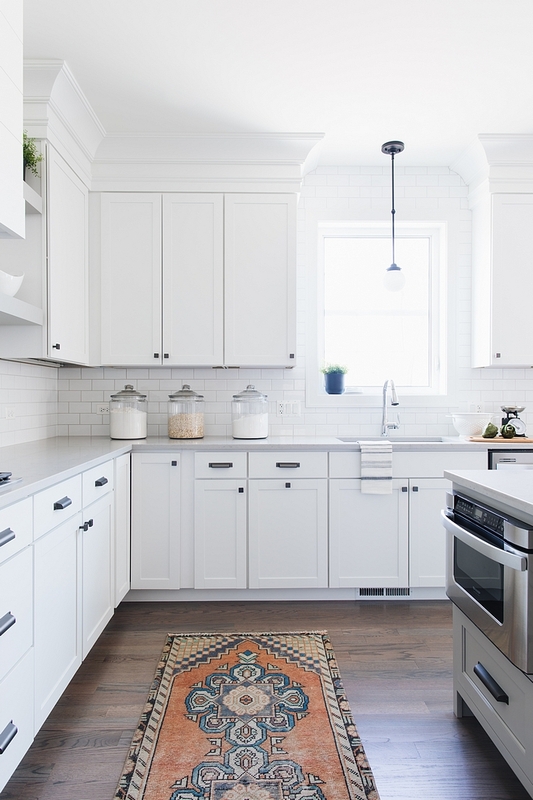 Kitchen Runner: Etsy – a great source for Vintage Runners…..I just type in “Vintage Rug Runner” and hundreds pop up at great prices. Most from Turkey so they take a few weeks to get but I’ve been happy with my purchase every time. Sink Pendant: Allen + Roth Webner 6-in Bronze Mini Globe Pendant. The floating shelves and island were painted Benjamin Moore OC-26 Ozark Shadows. 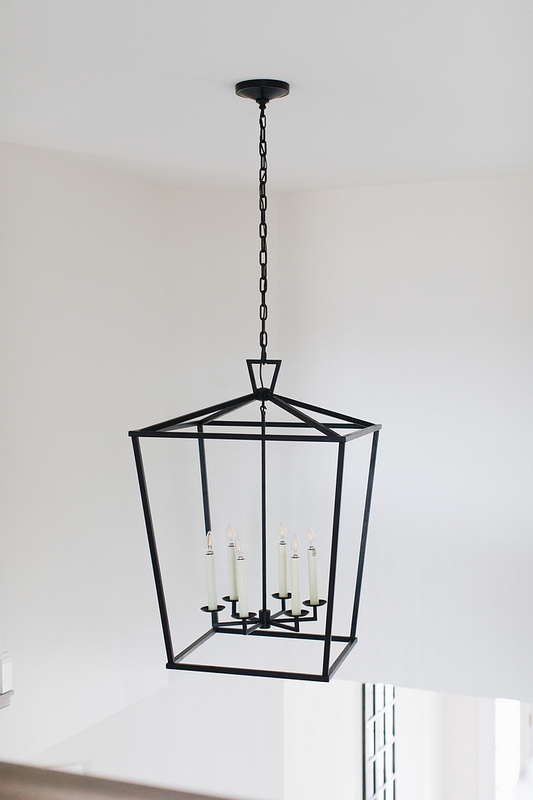 Chandelier over Island – Pottery Barn (currently on Sale!). Counterstools: Here & Here (matte). 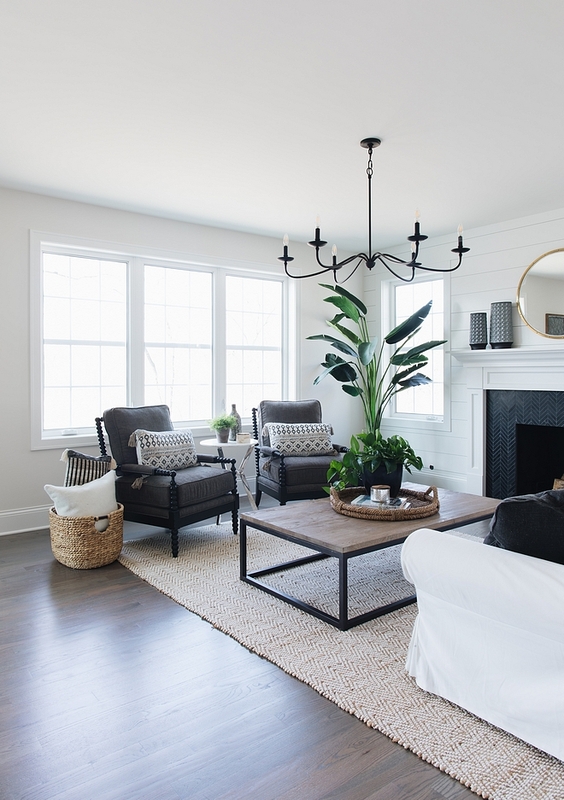 The paint color continues to be Classic Gray by Benjamin Moore, which is a great color to be used with either light or dark hardwood floors. 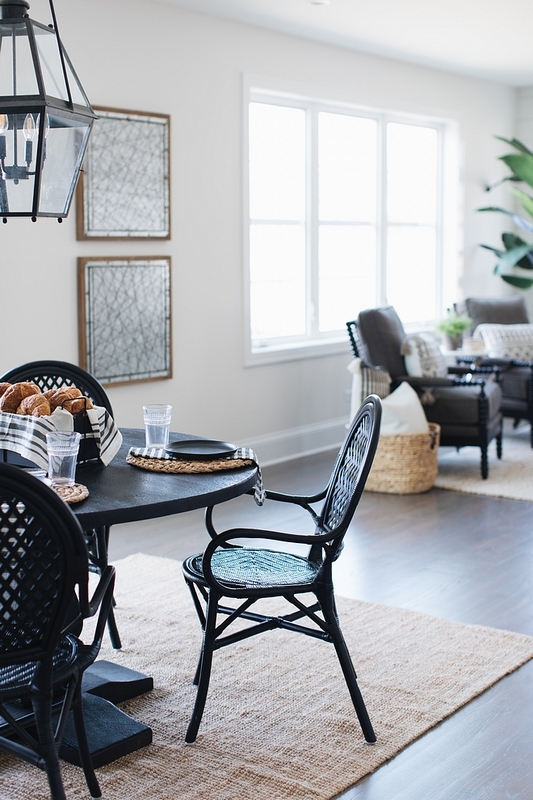 ” The breakfast area sits between the kitchen and the family room. 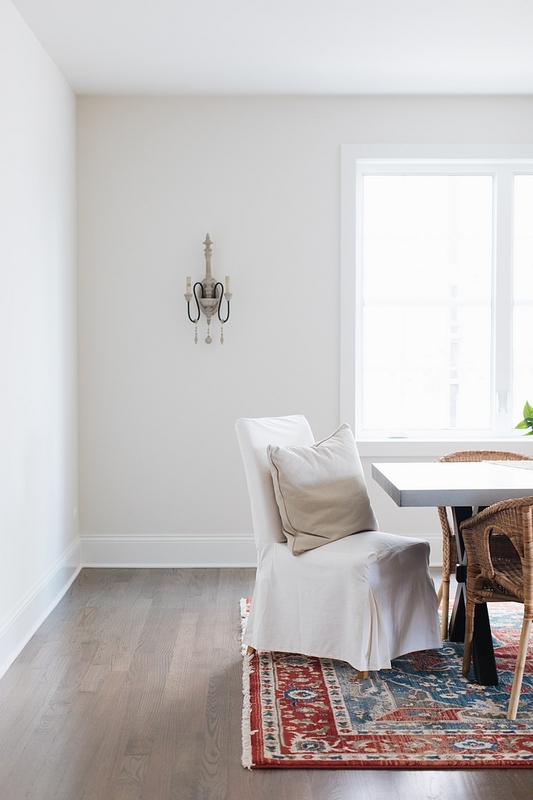 Because we used the large flowing light fixtures on either end of the space, I knew the fixtures over the table needed to be boxy and take on a different feel while still embracing the farm house look. 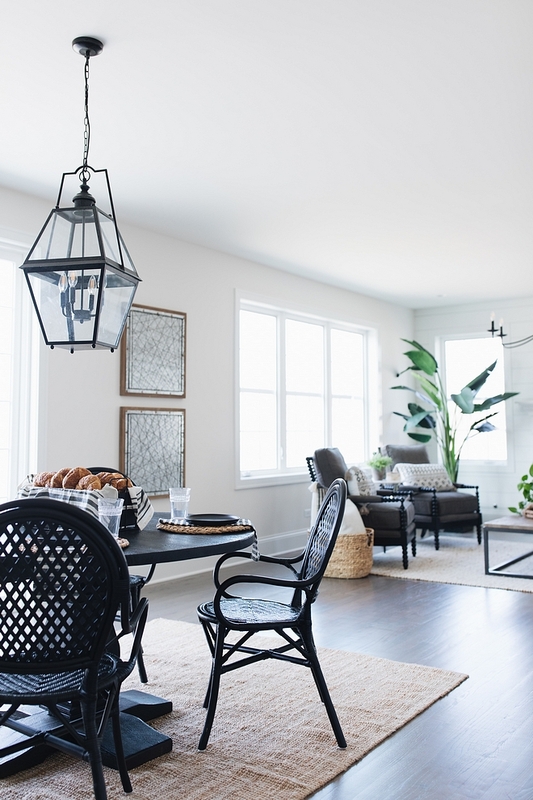 We went with a lantern from Pottery Barn that compliments the large room nicely.” – Julie Howard. Table – Home Decorators – similar here, here, here. ” The family room that is right off the Kitchen is 16’x20’. It is a nice size with lots of large windows. 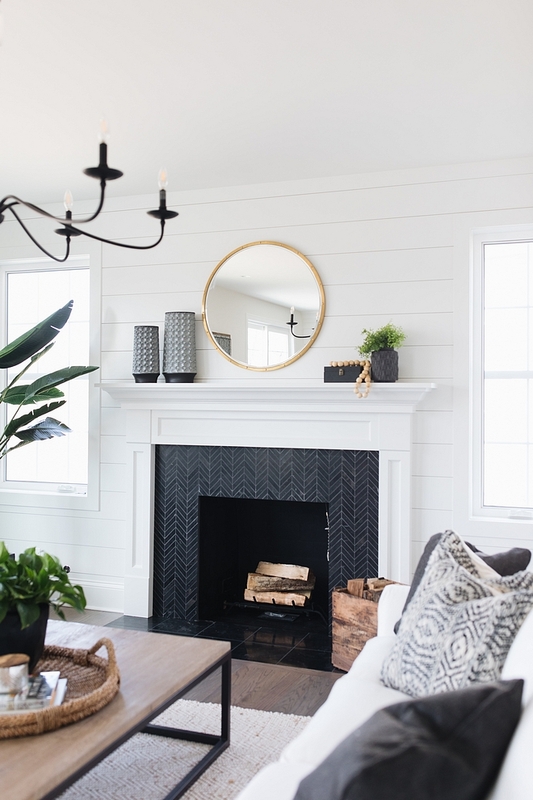 I used shiplap to clad the fireplace wall to add some detail without breaking the bank of shipping the whole space. 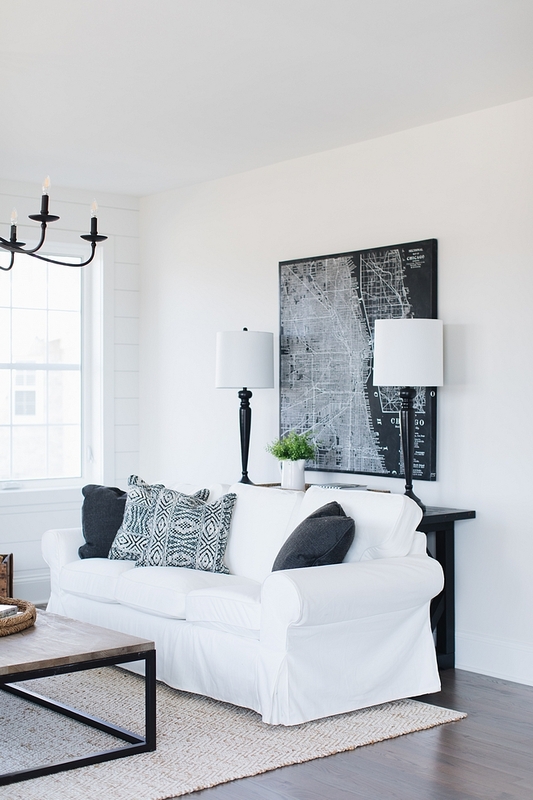 Just that one wall really helped to add visual detail to the room.” – Julie Howard. Chairs – Walter E Smith -Similar here, here & here. Banana Leaf Plant – Walter E Smithe – similar here. 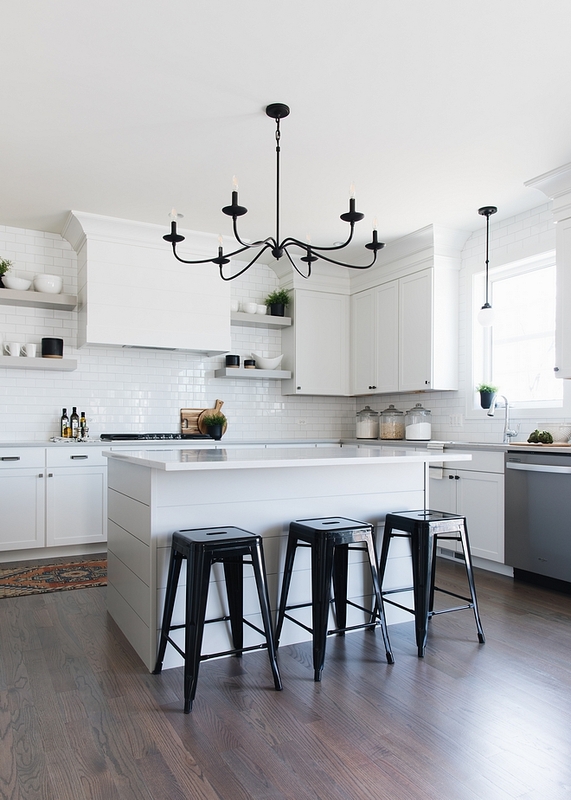 “Chandelier is the same as the kitchen island. Both of these chandeliers hang down in line about 20’ from each other and fill a space that together is about 44’ x 16’ . It looks great to have the same chandelier coming down on each end of a large open concept kitchen and family room.” – Julie Howard. 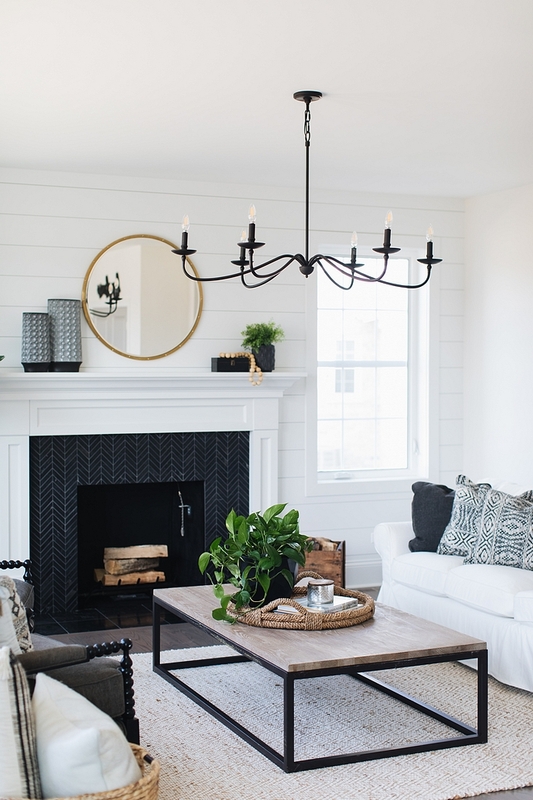 Chandelier is from Pottery Barn (currently on Sale!). Coffee Table – Home Goods – similar here, here & here. 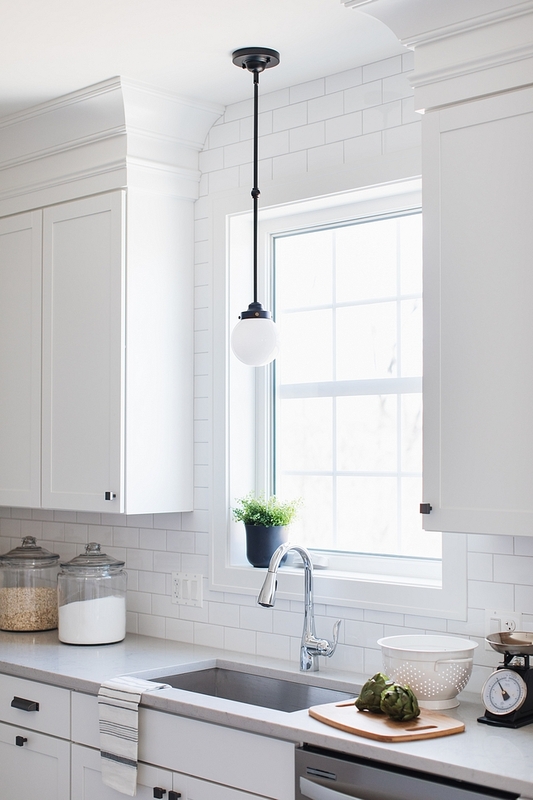 Shiplap Paint Color – to match the kitchen cabinets. 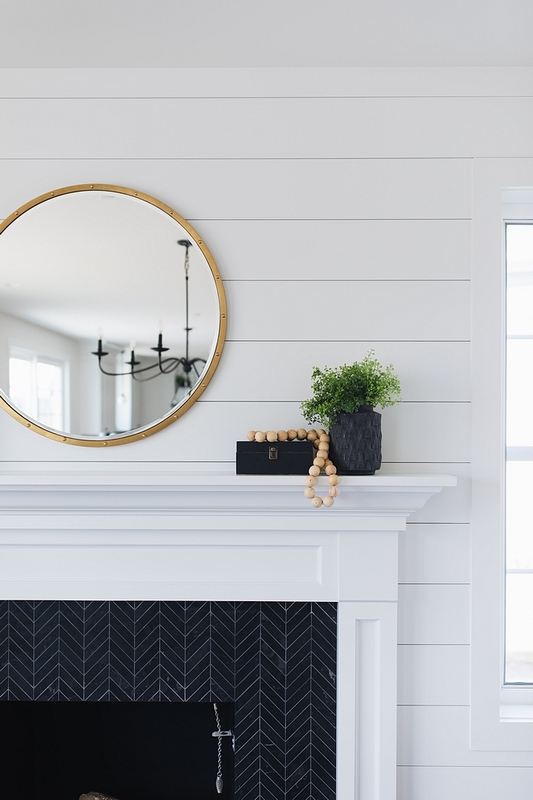 Fireplace Tile – from The Tile Shop Noir Chevron – similar here & here. White Slipcovered Sofa – Ikea – Affordable White Slipcovered Sofas: here, here, here, here & here. Rug – Home Decorators – Similar Here. Ozark Shadows by Benjamin Moore. 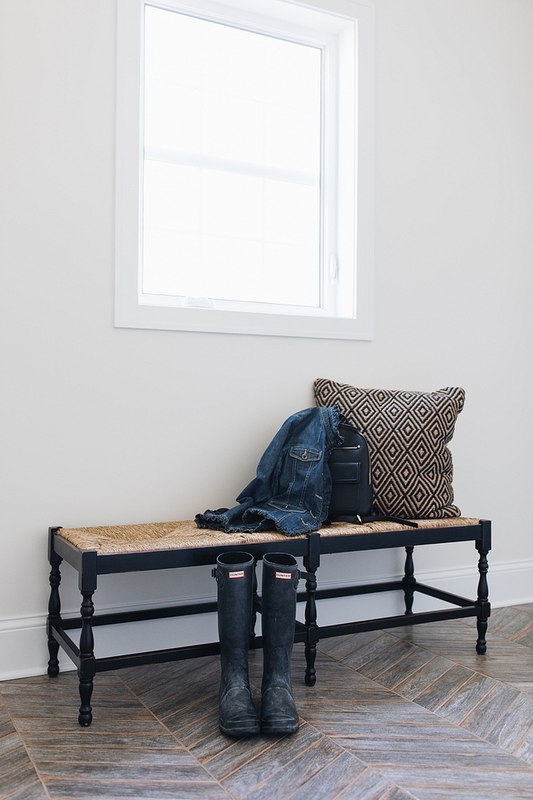 The mudroom features a chevron floor tile. Similar woven twisted-seagrass bench can be found here, here, here & here. Floor Tile: Bora Grey Chevron Porcelain Wall and Floor Tile – 3 x 16 in – The Tile Shop. 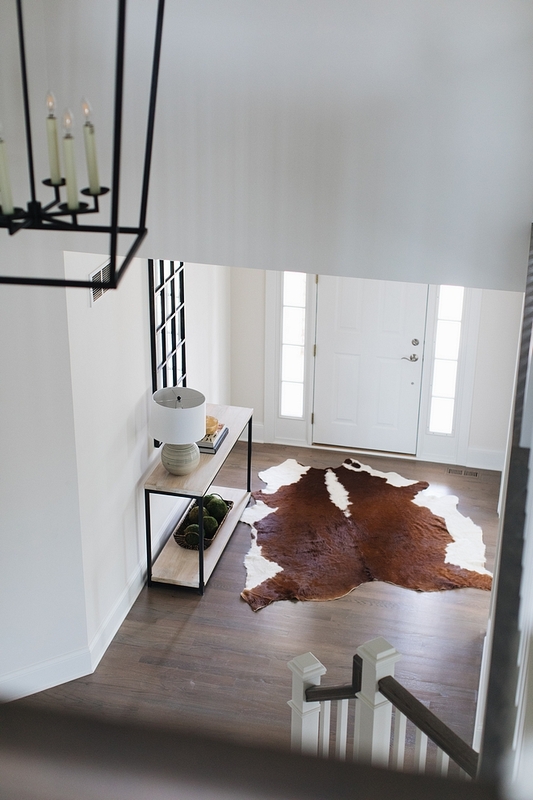 Cow hide rug is from Ikea. Faux Hide Rugs: Here. 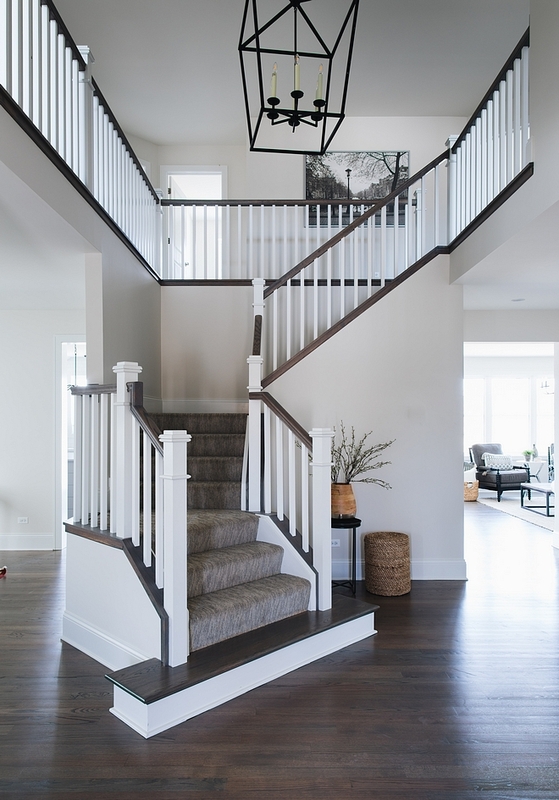 Light Fixture over Stairs – Visual Comfort Darlana in Iron. Desk and Desk Chair – Joss and Main. The Moravian Star Mercury Glass light fixture in the office is a go-to for us as it really adds drama to a small space. On top of drama it casts all this light in beautiful patterns to the room.” – Julie Howard. 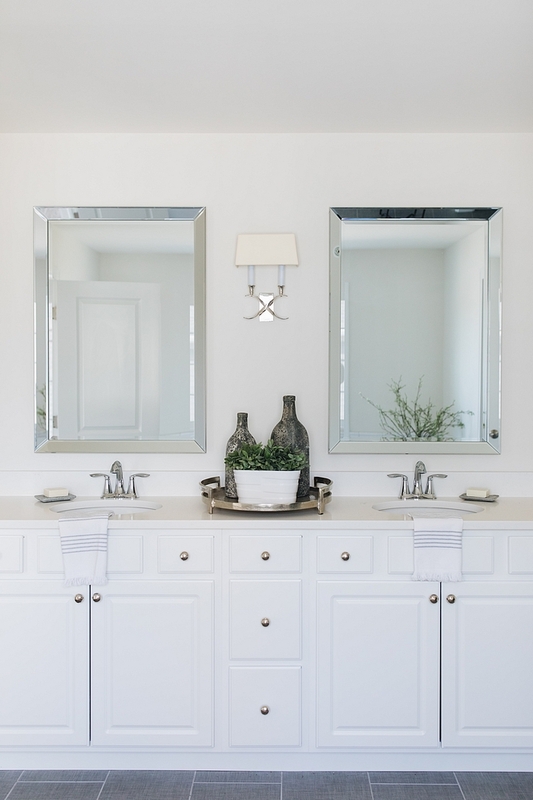 Lighting: Ballard Design – similar here, here, here & here. Chairs – Ikea – similar here & here (large). 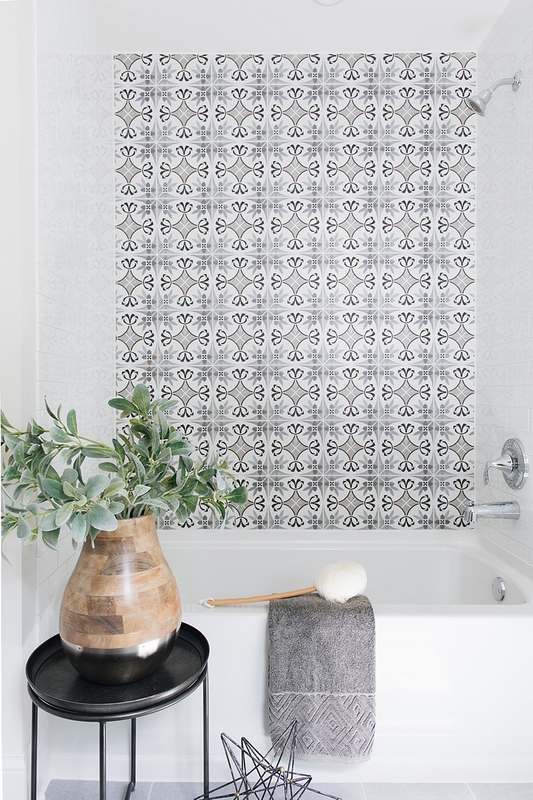 The black and white Encaustic Cement tile is Merola Tile Twenties Petal – here. 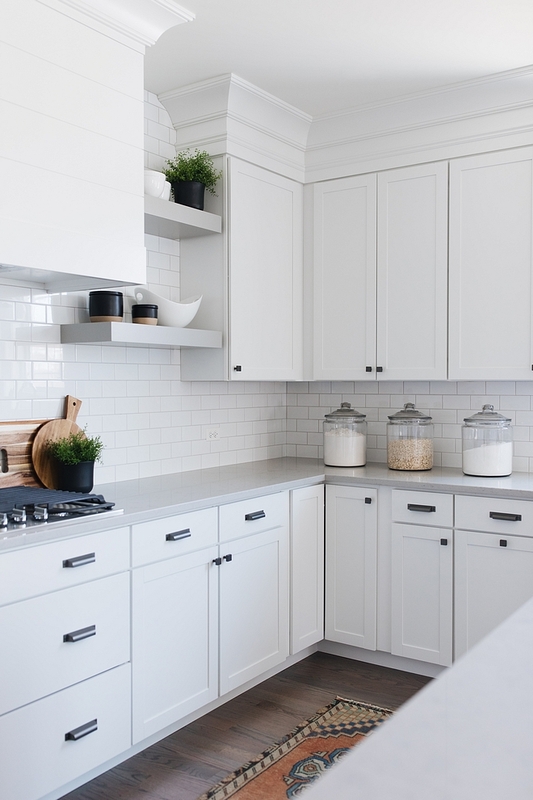 Keeping the cabinets white keeps with the classic look and will appeal to most buyers. Countertop is a dark grey quartz. 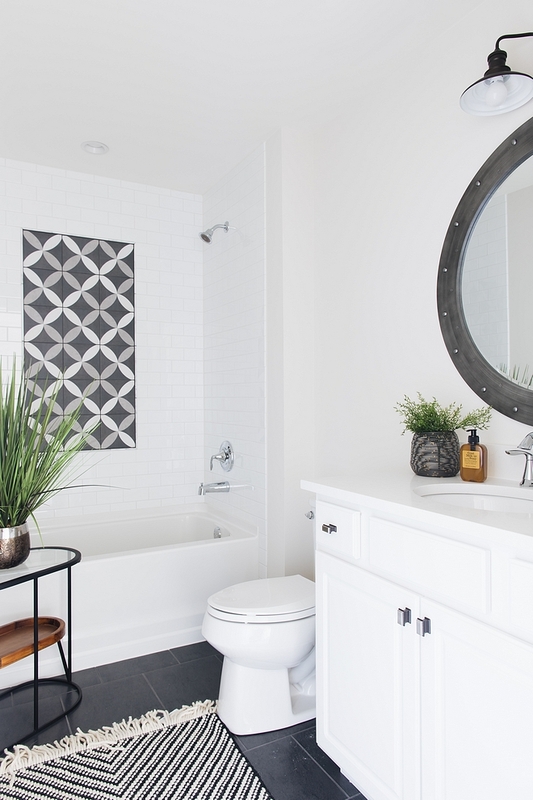 Using Encaustic Cement tiles as an accent gives the look of the very expensive bathroom without crushing your budget. The Encaustic Cement tile is The Tile Shop Art Sysley. 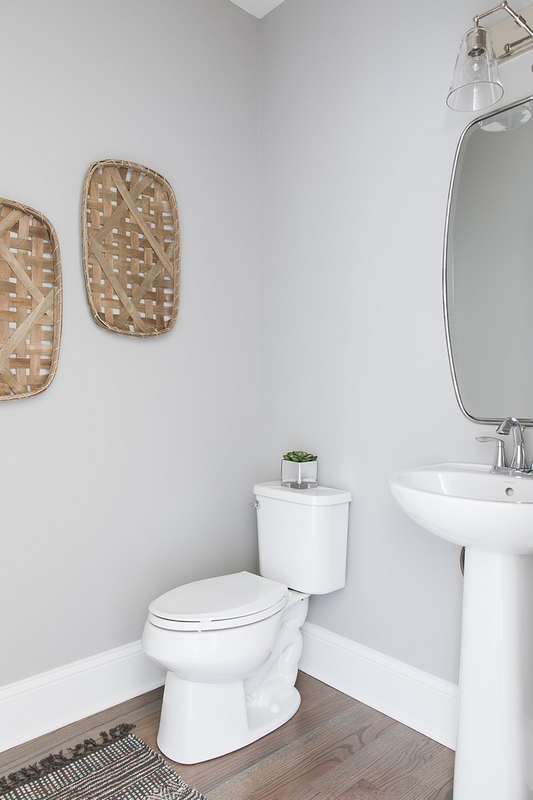 Mirrors are from HomeGoods – Similar mirrors can be found here. In the master we used a tile from The Tile Shop called “Caption” around the tub deck. It compliments the subway tile but adds some visual interest. Accessories from Target and HomeGoods. 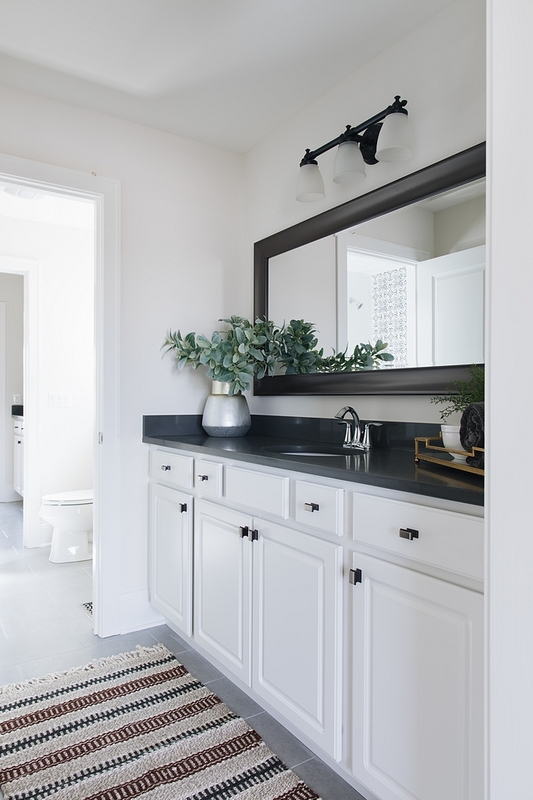 I think these bathrooms show how you don’t have to have a huge budget to create fresh, clean, bathrooms, that you’ll still love many years from now. 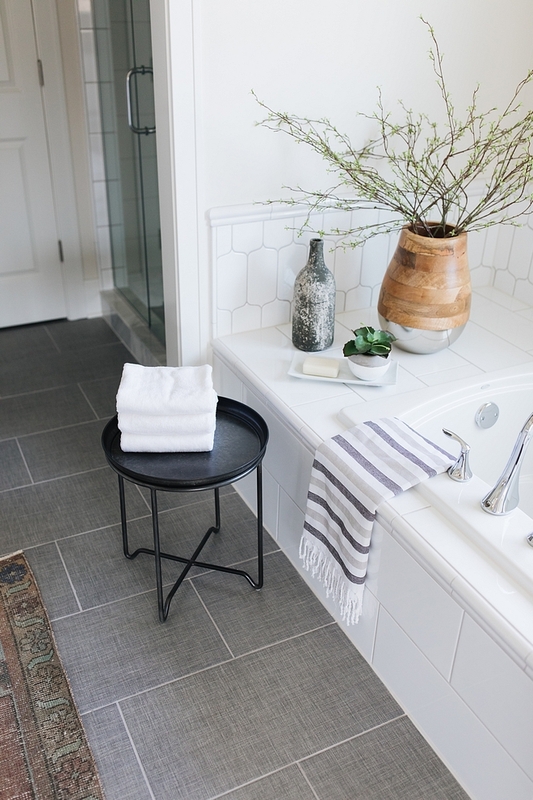 Bathroom Floor Tile: Loft Cement Porcelain Wall and Floor Tile 11 x 23 in – The Tile Shop. Similar Floor Tile: Here. 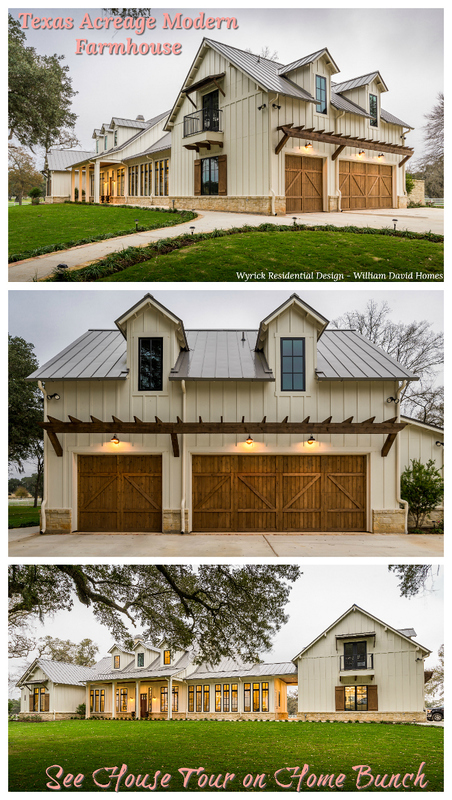 See other beautiful houses by Timber Trails Development Company on Home Bunch here & here.